Here’s a nice little news item along the lines of the story I referred to on wolves back in 2013, here. It shows one way the idea that we got from “fallen creation” teaching since the sixteenth century – that predators are a result of the fall and so are evil – has damaged our world. I explore this false, but near-universal, teaching of a fallen creation fully in my book, God’s Good Earth, which I’m pleased to say now looks like coming to publication at some stage not too far off. The back story of the BBC article, well known in Britain but possibly not in America or elsewhere, is the introduction of the American eastern grey squirrel, Sciurus carolinensis, into Britain some time in the nineteenth century. The story is that this was to provide exotic ornamentation to country houses: genetic studies show that it certainly arose from several separate introductions. Enter the pine marten, Martes martes which was common all over Britain 200 years ago, but which was hunted for its fur, and even more persecuted by game-keepers (presumably working for the rich estates showing off their exotic grey squirrels to politicians and gentleman scientists in between pheasant-shoots). This despite the fact that “it was never a serious threat to game birds.” Technology was part of the reason for this killing spree (see here) – breech-loading shotguns led to easy hunting of game on an industrial scale, and easy hunting of predators too. But the latter practice would never have so completely ruined the ecology (the list of British species driven to extinction or near-extinction in those enlightened times is depressingly long) unless associated with the idea that predators, like poachers, were “vermin”. The poachers were disposed of by spring-guns, mantraps and hanging or transportation. 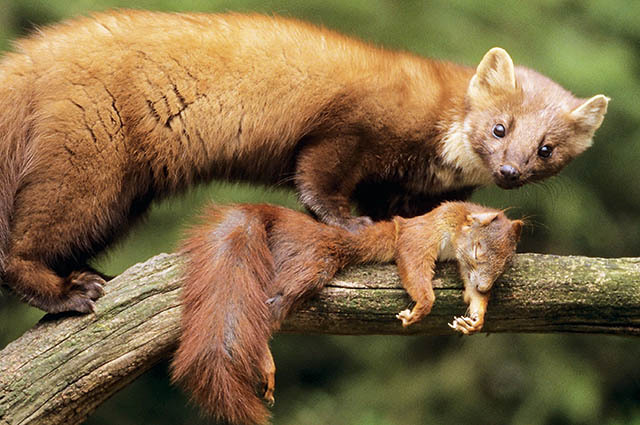 The pine martens left fewer survivors, in remote areas mainly in Scotland: currently, though numbers are beginning to recover, there are estimated to be only 3,600 (less than 100 in England, 60 in Wales, and the rest in Scotland). Well, as the BBC article surprisingly shows, where pine martens do occur, red squirrels, part of their natural prey, do well, and the alien greys decrease. 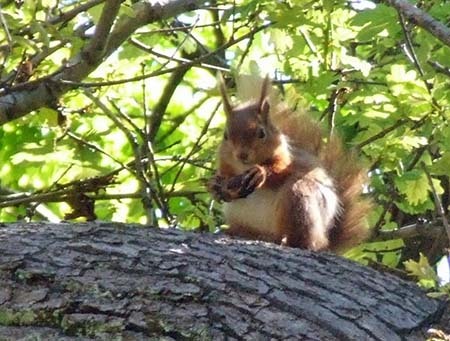 The piece suggests reasons, but the bottom line is that pine martens and red squirrels co-evolved, though it’s not absolutely clear what in evolutionary theory guarantees that predators don’t end up eradicating their prey and then starving to death, or turning veggie, themselves, apart from its magical power to do anything at all. In a theistic framework, of course, any secondary causes will be seen as operating downstream of the wisdom of Christ the logos in creating a system that works for the benefit of all. It’s a pretty dramatic demonstration of that when re-introducing a natural predator actually increases the numbers of endangered prey. That’s not universal – without their natural hunters, lynx and wolf, and mediaeval hunters with their bows, deer populations in Britain have now mushroomed to a level that threatens the environment. But neither is it uncommon, as the experience has been in Yellowstone Park after reintroducing wolves, as per my linked article above. From the time of Henry VIII until the First World War, systematic killing on a scale unthinkable today was directed at most of our familiar wild animals and many wild birds: badgers, foxes, hedgehogs, otters; green woodpeckers, jays, kingfishers, bullfinches. 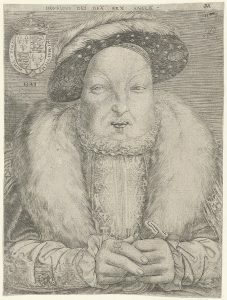 Millions were slaughtered, first, by country people, from about 1530 to 1800, to claim bounties under the Tudor vermin laws, and second, by gamekeepers controlling predators on aristocratic shooting estates, from about 1800 to 1914. People were actually fined heavily for not killing enough animals under these laws. Lovegrove names the immedate reason for the legislation as countering food shortages and spread of disease caused by a series of bad harvests and a sharp rise in the population. But he also mentions the teaching of man’s dominion in Genesis as a reason for it; animals “were here to be employed as beasts of toil, as food, for sport . . . or whatever other requirement”. That Genesis teaches the headship of mankind over the creatures is undoubted – but that did not lead to such laws until 1500 years after the rise of Christianity, even though bad harvests and population booms had occurred before. Perhaps it would prove difficult to pin down the exact motive for such laws, especially as the actual text appears not to be available online (and I’ve searched!). The fact that laws about what social ranks were permitted wear fur might have some bearing. But in my book, I dated the beginning of the doctrine of a fallen natural creation as late as the beginning of the Reformation (and suggested some reasons for it). What had been, before that, considered to be a creation reflecting God’s glory became marred “by the slime of the serpent” (as C H Spurgeon put it). The fact that the Reformation began fifteen years before the first vermin law of 1532 (the very same year that Henry began the break with Rome!) may be purely coincidental, but there’s no doubt that the new, antagonistic, attitude to nature is of a piece with what began to be taught theologically at the same time, just as it’s of a piece with the later attitude of Francis Bacon in his programme to “torture” nature to man’s use through science. What better way to redeem a fallen nature for man than by wiping out the bad guys? But between clerics misunderstanding Genesis and landowners creating a mechanized abattoir production line for wildlife, the pine marten did become virtually extinct in Britain. Who knows, if it had not, then introducing a few eastern grey squirrels might have been an entirely benign exercise in garden ornamentation. This entry was posted in Creation, History, Prometheus. Bookmark the permalink. Over here we have a breed called Fox Squirrels which do co-exist with those grays. They are also reddish especially on the tail and undersides, and larger than the grays. It seems the grays forage morning and evening while the afternoons are the realm of the fox squirrels. Back in my teaching days a student of mine did a study on it and found the populations in our region to be almost two grays for every one fox, though in terms of biomass they would be much closer to equal. Creation was subjected to futility, which is not the same as fallen. It is just that this realm is a place between- its not where His will is always done quickly and perfectly like heaven, nor a place where His perfect will can never be done like Hell, but rather a battleground which can go this way and that- for a time. I suppose the eastern greys and American reds co-exist as well in their New England environment. If those piebalds have anything to do with the lady’s Japanese albinos, she was playing a dangerous game inadvertantly. It’s difficult to know in advance when a species will be “invasive”: stupid animal rights protesters released hundreds of American mink from fur-farms here, which are widely believed to be the reason for drastic reductions in our native water vole population (though there had been previous escapes and other factors were depleting the voles). Now there is a massive trapping to try and redress things, though interestingly one point in my OP is borne out by the observation that because mink clean out the voles so efficiently, their own numbers can’t be maintained – more evidence that nothing in evolutionary theory guarantees the development of balanced ecosystems. Another factor that controls mink is the native otter – yet another species persecuted to near-extinction since Tudor times and only slowly recovering now. I wonder if it’s possible that environments become more susceptible to invasion if they’re already, like Britain’s, severely damaged. Interesting research to do. On the other hand, rose-ringed parakeets released in London (by Jimi Hendrix, the urban myth has it) are now commonly seen around east London and beyond, and the experts seem to think it’s having no detrimental effects.